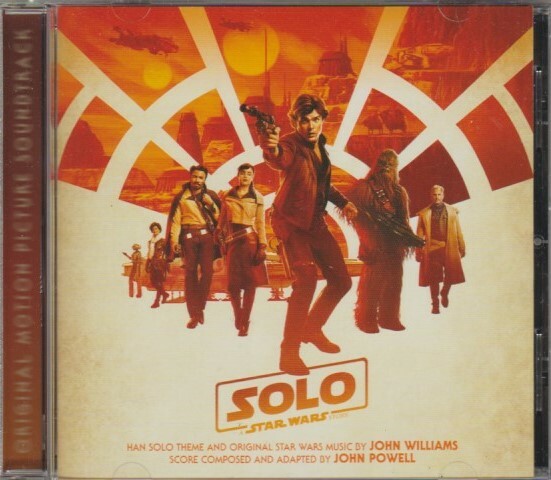 The second Star Wars spinoff movie, based on that ol’ scoundrel Han Solo, is also the second Star Wars movie with a soundtrack by someone other than John Williams. He still helms the main “Saga” films, but this time out John Powell had the difficult task of writing new Star Wars music. Powell’s career has mostly centred on kids’ movies like Antz and Shrek. He had an Oscar nomination for How to Train Your Dragon. He’s also known for action scores, like the Bourne movies and and X-Men: The Last Stand. Though Solo has plenty of action, Powell doesn’t go for tired action cliches in his score. And of course, there are plenty of callbacks and reprises of old Williams themes that you’ll never forget. The opening cue “The Adventures of Han” begins sounding like an old film reel, before settling into something Marvel-like and heroic. This track was actually composed and conducted by Williams himself, providing the essence of a new theme for Han. Solo is a different kind of Star Wars movie, even from Rogue One (conducted by Michael Giacchino). Likewise, its score is different too though still living in the same universe. Modern percussion and instrumentation can be found alongside the traditional. Han comes from a dark corner of the galaxy, and the score is fraught with tension over oceans of calm (“Flying with Chewbacca”). The characters of Han Solo and Lando Calrissian are loaded with panache, and so are parts of the score. Some of the best tracks are the dark “Spaceport”, which is contrasted by the rhythmic action of “Train Heist”. Much of this score just sounds like a heist film. “Is This Seat Taken?” has that kind of quiet tension (with some peaks of themes in the background). It’s all very appropriate for sneaking around and trying to steal stuff like a scoundrel. There there are some more familiar sounds, like when the Falcon shows up. When it does, expect more hi-jinks, excitement and drama from this soundtrack. It rarely gets dull, but strap yourself in for “Reminiscence Therapy”. 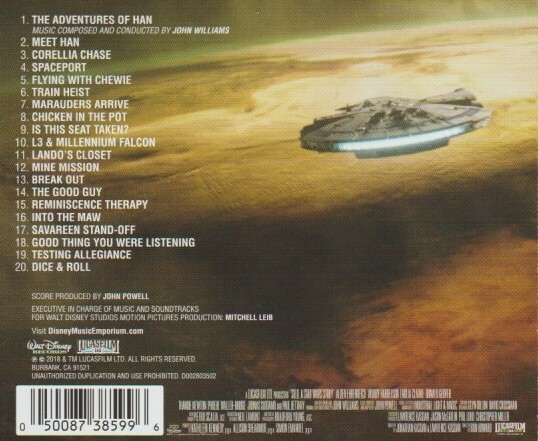 It’s a virtual greatest hits of themes, including the ones from Solo. To be charitable, two tracks don’t work as well as others. Star Wars movies tend to have a lounge or bar scene with a band. “Chicken in the Pot” has annoyingly modern R&B beats, just not right for Star Wars, weird languages aside. “Dice & Roll” is also a bit too close to home for a galaxy far, far away. 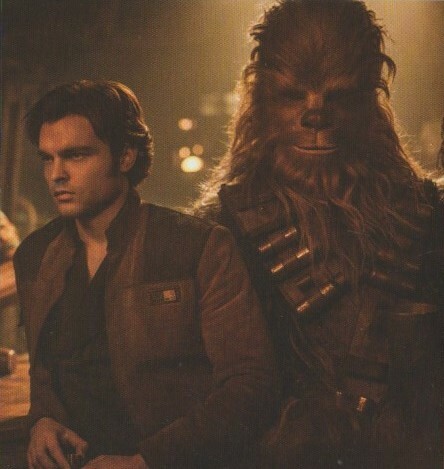 Solo turns out to be one of the pleasant surprises of 2018. It’s a soundtrack far better than expected. I really enjoyed the movie more than I thought I would based on things I was hearing. The music was awesome and it didn’t matter it wasn’t Mr. Williams. It played well with the movie. You said it man – it didn’t matter! This is good for the future of Star Wars. I like those soundtracks that exceed expectations! Me too! And if people don’t like the movies, the soundtracks are not to blame.